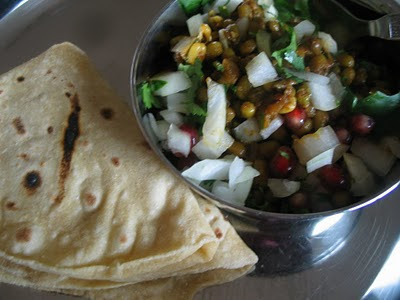 Maharastrian usal is very versatile and nutritious preparation. Usal can be served for any meal of the day .This is one of my favorite maharastrian dishes. I cannot say how authentic my recipe is but i can sure say my family likes it .It can be served with pav , paratha or roti. Tastes good by itself too as a evening snack just sprinkle some sev over it .Usal i think is like sundal can be prepared with moong,moth,whole masoor etc. 2. And sprout it.Sprouting is optional but sure adds to the nutritional value. 3. Heat oil add hing , mustard and cumin. 4. When mustard pops add ginger garlic paste and cook for two minutes. 5. Add onion and cook till golden. 6. Add turmeric , chilli pw , dhania jeera pw and cook for a sec. 7. Add sprouted moong and 3/4 cup of water. 8. Add salt , garam masala and amchur pw . 9. Cover and cook till the moong is tender but not mushy. 10. Add lemon juice to taste and mix well. 11. 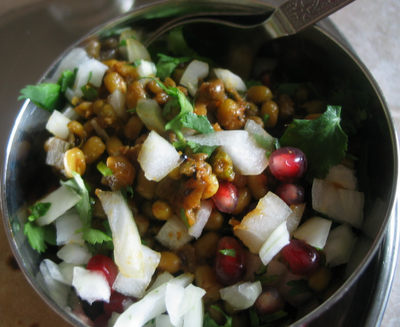 Before serving add chopped onion ,coriander leaves and pomegranate seeds. I'm sending this MLLA - 18 hosted at cookingforallseasons started by susan . Looking different and colourful with pomegranate. Looks great Nisha..thanks for sending..